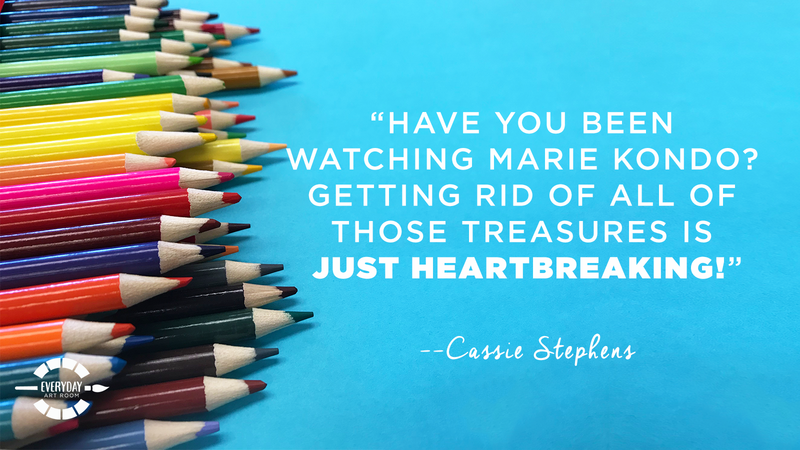 Tidying Up is all the rage on Netflix right now, and Marie Kondo has everyone throwing out their treasures. But can any art teacher reconcile that thinking with what is actually happening in their classroom? 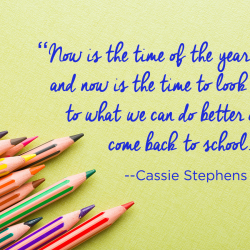 In this episode, Cassie talks about why we need to hoard a lot of different things, including toothbrushes, pom poms, and about 20 other items. She might even have a few ideas on how to use everything you’re about to start collecting. Full episode transcript below. Please don’t get me started on the amount of times that I have gone through other teachers’ wastebaskets to pull out their dried up markers. The marker cap, hello! It’s a printmaking tool, and the marker juice itself, it can be made into some amazing paint. So, I’m going to tell you to keep on hoarding all those things today, and I want to share with you my top 20. That’s right, 20 things that some people might see as one thing, trash or a mere doggy dish, whereas we art teachers, we see them as the amazing potential that they might have in our art room. I am Cassie Stephens, and this is Everyday Art Room. Since we have 20 things we’re going to be talking about today, I’m going to dive right in. Some of these things you might already use in your art room, some of these others, I have a feeling I’m about to blow your mind, and you are going to become the ultimate pack rat. You can thank me later. Alright, starting at the top, my favorite clay tool, the toothbrush. The toothbrush as an essential clay tool. In my art room, this is how we slip and score all pieces of clay together. You can find toothbrushes on the cheap. I prefer to buy them new. I get them at the Dollar Tree. However, I do love to tell my students that they’re my principal’s old toothbrushes. Regardless, this tool is perfect, because if you’re teaching itty bitties like I am, kindergarten and all the way up to fourth grade, when it comes to slipping and scoring, it’s not exactly the most fun or glamorous part about working with clay. So, a lot of times, my students, I noticed was skipping that vital step only to find that their clay pieces were falling apart when they would get them back after the bisk fire. However, having a toothbrush in a little like … I use a butter dish or a little cup of water. The water acts as your slip, especially the more the kids use it when their actually becomes a little bit of clay build up in the bottom of that cup. So, there’s your slip. And then the toothbrush does an awesome job of scoring. The toothbrush adds just a little bit of that water or slip, and does the perfect amount of scratching. Once my kids use a toothbrush on both surfaces, they attach and it sticks beautifully. So, toothbrush as an essential clay tool. Alright, number two. This is a brand new one to my art room, so you know I’m super stoked. My kids are too. Mitch, my husband, got me a record player for Christmas, and it has become an unexpected time traveling device in my art room. I brought in a bunch of my Disney records and records that I had as a kid, because, hello, I don’t throw anything away. We already covered that. My kids have absolutely loved listening to the records. They love looking at what a record is, learning about how it works, watching the turntable spin the record. They love seeing the little arm with the needle come down, and the nice, beautiful crackle that it makes. I cannot recommend it enough. If you don’t have a record player, your librarian might. In fact, that’s where I got a record player years ago before it finally bit the dust. They usually have a bunch of the old record players from back in the day. Grab a couple of those and a couple of records that you can find at the thrift store, and prepare to have a lot of fun conversations with your students. Next up, I know I’ve chatted about it before … I’m a big fan of the dry erase board as a waste-free sketching tool. My first couple of years teaching I let my students do a lot of free draws, and there was a lot of wasted paper, especially when you have just a couple of minutes left. I also have a lot of students who are a little bit wary of attacking a brand new, beautiful white piece of paper for fear that they’re going to “mess it up.” I have noticed that a dry erase board as a sketching tool is this beautiful, forgiving, slick, fun surface for your kids to draw on. It allows them to kind of plan their ideas without a lot of erasing. They can kind of get all of their ideas down. My students then use that to work from, a lot of times, or if they do finish early then they’ll grab a How To Draw book, or what I call an idea stick, which is a Popsicle stick with a couple of drawing ideas on it. They use that. So, if you don’t have a class set of dry erase boards and some dry erase markers … and I use little cut pieces of felt as an eraser … then you need to get some. Again, the Dollar Tree is your best source. Speaking of Dollar Tree, the doggie bowl as the perfect no-spill water tray. Who would have thunk it? A doggie dish, as you all know, has two compartments, food and water. In my room, we use one side for water and then the other side, I’ve cut a little sponge that fits perfectly in the other side of the doggie dish. The beautiful thing about these is they don’t tip. I mean, at least the ones that I have don’t, and I purchased them for just a dollar. My students know that they need to wash their brush on one side, and then dry their brush, especially if we’re doing watercolor paint, dry their brush on what we call dirty old Sponge Bob, who resides on the other side of the doggie dish. Now, a moment ago I was mentioning dried markers. So, number five on my list, dried markers, and those nearly empty watercolor pans. You know, the ones that you can pop in and out of your watercolor trays? Those make perfect liquid watercolor paint. Now, I’m not going to like … I’m going to burst your bubble a little bit. It’s not going to make as vibrant of color as the liquid watercolor paints that you might buy. But in a pinch, they do make some pretty awesome colors. There’s a couple of different ways that you can go about using them. Probably one of the easiest ways is to get some spray bottles, empty spray bottles that you can find at a beauty supply store, and you could just throw the markers in the bottom of the spray bottle, and also those little pans. I always put like, all of the reds in one spray bottle, all of the yellows in another, add some water. I would fill it about half full, keeping in mind the more water you add, the more diluted the color is going to be. Then just let it sit overnight. The water will come out of the marker, it will come off of those little pans, and then you have a watercolor in a spray bottle, which can be great if you’re going to cover the surface with a nice wash of color. Or if you’re going to have the kids use that for paint, then just take the nozzle off the spray bottle, and then just pour from there. Now, if you really want to get all sorts of scientific about it, and technical and really go to town on those markers, you can get a pair of pliers and pull the marker apart, starting at the very back of the marker, especially if it’s a Crayola. You can pull off the backside. Inside that marker is a piece of felt that’s been soaked, in I guess kind of like, a watercolor paint. We call it marker juice. That’s how the marker gets its juice. You could remove that piece of felt, and put that in your spray bottle. Now, I don’t use the spray bottle method. I actually have Mason jars, glass Mason jars, and what I do with that is I rubber band together all markers that are the same color, and I fill a Mason jar about half full, and I put all of the markers facing down into the jar, and I just let all of the marker juice drain from the marker. I don’t go the extra step of removing the felt. I’m too lazy for that. Then once all of that’s been drained, take the markers out and put the lid on the jar. Just a little side note, save the marker caps. As I said, they’re awesome for printmaking and even for clay, and don’t throw the rest of the marker away. Crayola actually has a recycling program. My bookkeeper at my school runs that program. So, I don’t know for certain if you have to have the cap on the marker or not. Worth looking into. Much better than just throwing them away. Now, who would have thought that a mere, lowly pom pom, one that you could either make or buy at the store, as the ultimate quiet class tool? That’s right. 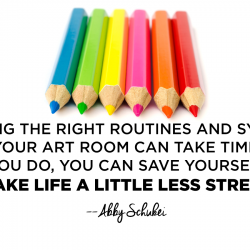 You need a quiet art class for a day, or you just desire to teach in a quiet art room … Here’s what really works for the littles. Kindergarten and first grade tend to eat this up. You take that lowly pom pom, you hot glue a couple of googly eyes on that thing, and you call them Quiet Critters that only come to the quietest of tables, that sadly, have to leave if a table gets too noisy. You will be amazed at the magic of a lowly pom pom. Quiet Critters. Check it out. I believe I have an entire podcast about that. I know for certain there’s a whole blog post about it too. So, if you don’t believe me, check it out, and just step back and prepare to be amazed. Next on my list, toilet paper tube as the ultimate sculpting and printmaking tool. Alright, so, we already know that a toilet paper tube can stamp a circle. I mean, that one’s pretty easy. But did you know that if you fold your toilet paper tube with a V at the bottom by just pinching it, and then bring the top part, push it down, and bring the two top parts together, it will create a heart shape. Works a little bit better if once you’ve got that heart shape, you place a little rubber band around it. Then perfect for Valentine’s Day, you have a heart-shaped stamp. Speaking of rubber bands, if you wrap a rubber band around a toilet paper tube, and then roll that through some paint, it also makes a really great tool. Now, after a while, those tools are going to start to disintegrate, because the toilet paper tube is just paper. So, they won’t last long. But while they do, they make a pretty awesome tool. I love toilet paper tubes because … I wish I had a t-shirt for that. Don’t all art teachers need a t-shirt that says that? “I love toilet paper tubes!” I said that with such passion. I love toilet paper tubes because they are super great for making sculptures of pencils and crayons. Last year my first graders used them to make little … We called them stubby pencils. They were so cute, and you can find … And I said first grade. I said the sculpture. They turned out amazing. You can find the details on that on my blog. Be sure and check it out. I’m still kind of giggling over the whole I love toilet paper tubes. I heart TP. Next up on my list is my new favorite surface for my kids to work on. This came out of a pure crisis. I am a procrastinator, in case you didn’t know, as if it wasn’t obvious. I didn’t put in my supply order that was due in July. I didn’t put it in until December, because, as I said, procrastinator. Y’all, I straight up ran out of paper. Who runs out of paper? What art teacher has zero sheets of paper to her name? I got so desperate that I had to call my art teacher BFF and she had to hand deliver a packet of paper, which obviously, we went through in no time flat. Even the local craft stores had no more white paper. Maybe I wasn’t the only one who hadn’t put in her order. Regardless, I, in the back of my closet, have a bunch of cardboard pizza rounds. They have become my new favorite surface for my kids to work on. We started making abstract paintings on these cardboard pizza rounds, then third grade did landscapes. Fourth grade is currently making snow globes on these cardboard pizza rounds, and they look great. Where do you get them? That’s the question I get a lot. I am fortunate that on my drive home I live near a restaurant supply company. So, you could definitely hit up one of those. The one that I go to is called GFS, in case there’s one in your area. I know Amazon usually, or used to sell, cardboard pizza rounds. You can get them in a box of 100. I think they come in about three different sizes. A box of 100 is about twenty bucks. So, pretty cool, different tool. I definitely would not hit up your pizza parlor. They have to pay for those. So, you might want to be respectful of them. Plus, you don’t want any used or greasy ones. Like, ew. Not unless you’re making a pizza for your art. Now, this trick I learned from a great friend of mine. She works in my district, and her name’s Jennifer Alvarado, and I love her dearly. Liquid starch as the coolest art room hack ever. So, Sta-Flo liquid starch … By the way, that’s my rapper name, Sta-Flo, in case you didn’t know. Sta-Flo liquid starch, you can find in Walmart, just about any big, big grocery store is going to have it. It comes in a big, blue jug. All you need is one big, blue jug. It will last you forever. So, what are you going to do with the stuff, you’re wondering? What you do is this. You take those pesky chalk pastels … You know the kind, where the kid makes a beautiful work of art and then they smear all over the place. Draw a little bit … I’m sorry, color a little bit with the chalk pastel, dip your finger in the liquid starch, and massage it over the chalk. Watch the chalk immediately set and turn into this really rich, beautiful watercolor kind of medium. I love this. It’s great for landscapes. We’ve done it with the self-portraits when we wanted them to really be colorful and have a nice pop to them. You don’t have to spray it afterward. The chalk is then sealed and set. I know I’m blowing your mind right now, but you need to check it out. Sta-Flo liquid starch and chalk pastels. The bomb dot com. Speaking of chalk pastels, if you aren’t using liquid starch, how in the world do you set it? Aqua Net. Man, they sure don’t make Aqua Net like they used to, you know, back in the 80s when I was hosing my entire head helmet down. It had a beautiful, nice mist to it. Now it does spit and sputter out a little bit, leaving sometimes speckles on my students’ artwork. But you know what? At least it’s set. I find that on the cheap at dollar stores. Tim: Hello. This Tim Bogatz from Art Ed Radio. 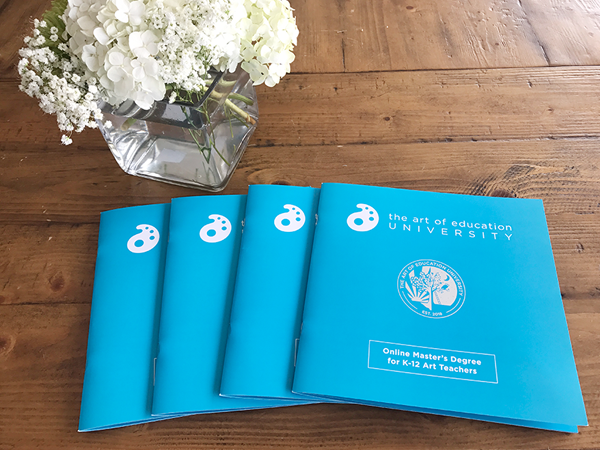 Today I want to tell you about one of our awesome sponsors for the Art Ed Now Conference, Art to Remember. They’re helping us bring all of the amazing presenters to you, and they are putting some really nice materials for you in the swag box. Now, if you haven’t worked with Art to Remember before, it is hands down the easiest fundraiser you can run in an art classroom. They send you the paper you need, there’s no cost for shipping the work, and they send all of the products organized for you. So, if you need lesson ideas, they are a ton on their website, and you’ll also see a lesson presentation from Amanda O’Shaughnessy at the Art Ed Now Conference. Honestly, when my own kids are doing a fundraiser like this at their school, it doesn’t even feel like a fundraiser. I’m always excited to see what I can get, and I love to see what kind of stuff my own kids can bring home. So, if you are looking for a fundraiser, Art to Remember is the place to start. If you’re curious about it or you haven’t done one before, there’s a profit calculator on their website where you can enter a few stats and estimate how much you’ll earn. So, if you go fill out their get started form or email them, they can put together a sample schedule, send you products and materials for you. So, make sure you check them out at arttoremember.com, and make sure you check out the details for our online Conference, coming up on February 2nd at artednow.com. Now, let me turn it back over to Cassie so she can finish the show. Cassie: Okay. I’m kind of ashamed to admit that this next hack that I’m going to share with you, I just learned recently. When I learned it I was totally shamed, because I didn’t know it already. When you’re storing your markers or your Sharpies, you should always store them upside down. That way all the marker juice continues to flow to the end of the marker. If you’re sitting there rolling your eyes like, “Uh, Cassie, how did you not know that?” Well, stop shaming me. I don’t know. I always have my markers standing up, because I want to see what colors they are! Yeah. It actually works. They do last a lot longer. 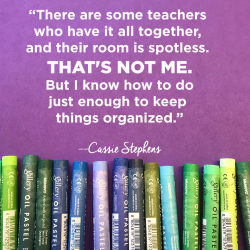 Me, personally, in my classroom, all of my students’ markers are in trays anyway. So, none of them are standing upright. They all lay on their sides. So, technically I was just fine. But I had no idea that they needed to be upside down. Alright, now let’s move on. Watered down paint as the ultimate chalk sealer/snow sprinkler. So, speaking of chalk pastel, I love chalk pastel, y’all. Can you tell? I mean, this is the third little hack that I’m sharing with you about it. I used to hate chalk pastel. So, this is just a side note. I hated it, number one because I always found that the chalk pastel my students were using was total junk. It made this crazy scrape across their paper. The colors weren’t vibrant. It seemed to be mostly filler. So, I’m just going to throw it out there, my favorite brand, because I get asked a lot, is Faber-Castell. What I found is this, that watered down acrylic paint, the sprinkling of that helped to seal their chalk, and it made for a really beautiful effect. I mean, I plan to share that lesson on my blog very soon. So, be on the lookout for it. The kids have loved it, and the results are beautiful. Now, speaking of watered down, this hack I recently learned from a friend’s art teacher friends that I follow on Instagram. I know we’ve chatted about this. I’ve mentioned it last week. If you’re not sure who to follow on Instagram, start with the hashtags. Start by following #artteachersofinstagram or #artteachersofIG, or just #artteachers. That will lead you to some really amazing art teachers out there that you should definitely follow. From a couple of them, I learned this trick. A lot of us who don’t have kilns, or maybe we do, but we only want to do the one firing, we still want to seal our students’ artwork and make it look nice and shiny. It’s hard to do that when you don’t have a glaze and you don’t have a way to fire clay pieces, unless you use Mod Podge. But y’all know it’s such a hassle to have all of the kids sit there and paint with the Mod Podge. There’s this smell, and the stuff goes on very thickly, and there’s a lot of waste there. Recently somebody shared that just like I was talking about putting water and paint in a spray bottle, put Mod Podge and water in a spray bottle, shake that up really well, and spray the kids’ projects with that. It’s like a clear varnish! Then it goes by a lot faster, and not nearly as odor-ific. Glue gun and tag board as the ultimate texture rubbing tool. I wanted my kindergartners to do a lot of texture rubbings, but I don’t have a ton of texture rubbing plates. Last year I cut a bunch of tag board into about two inch by three-inch squares, and I just drew tons of different designs all over the pieces of tag board with my hot glue gun. I did polka dots, I did stripes, I did zig-zags. I just laid them all out on a table, and I did as many different designs as I could. Let them sit for a minute, and voilà! You now have the ultimate texture rubbing tool, and the bonus is it was super cheap and they lasted. My kids have now used them for two years. They simply slide them under their paper. We’ve been using oil pastels. We call them … don’t judge … naked oil pastels, because they don’t have any paper around them. That’s what they’ve used. They hold their oil pastel like it’s shh, sleeping, and we do the texture rubbing that way. So, if you find that you don’t have any texture rubbing tools, there’s so many things in that art supply catalog when you flip through it, that you just think, “Man, if I had all the money in the world.” Y’all don’t need it. We can make half of this stuff, and that’s, to me, a lot of fun goes into that part too. Alright. Now, here’s one that I have found to be really helpful, especially with my younger students when they’re painting. When my students are painting, no matter what they’re painting with, I have large trays that have a little bit of a lip to them. That’s what I use to put their painting supplies in. So, in that tray there’s their dog dish, there’s their either watercolor, tempera, or even tempera cakes. The reason I keep it on that tray is like I said, it’s easier for me to carry it to the table, and if we do have any spills, if there’s any splashing of the paintbrush, a tray keeps it all nice and contained. That way if my class coming in afterward is doing collage or they’re drawing, there’s not water splattered all over the table. I manage to get a lot of trays really inexpensively from a hospital supply catalog. Hospital supply is where it’s at. I’ve found a lot of great things for sorting and distributing art supplies, and definitely, these trays were one of my favorites. These are the things I wish I would have known, and therefore, I share with you. Now, I am a person who has a large counter in my art room. I love to have everything laid out. I have to have all of my supplies where I can see them. Putting everything on your counter and all over tabletops, it just becomes a huge mess. Last year I started hanging art supplies, and it’s really helped me keep the visual as well as keep the clutter at bay. So, I have placed all of my certain size paintbrushes in separate cans, and I have command hooks that I’ve attached to my wall under my cabinets, near my sink, and that’s where my paintbrushes reside. At Christmas break, I even decided to take it a step further, and hang up all of my students’ drawing and tracing tools, the circle tracer. I even punched holes in our color wheels and hung those up. That way it’s still there, it’s still visible for my kids to find it, but at least it’s not stacked on top of everything else, and it’s out of the way. Alright, my last couple of things to share. 3M spray glue is the fastest way to mount artwork, especially when you’re matting it, not mounting it to the wall, but when you’re matting it or framing it, make sure you cover your area, because that spray glue … It’s called spray glue because it sprays everywhere. It will get on every surface and you can’t get it off easily. But spray the back of it, flip it over, put it on a piece of construction paper, and boom. It’s framed. If you do the Artomé Art Show, this is also how I frame artwork for that. Quick, fast, easy. Last but not least, guys, ice cube trays with lids for tempera paint. What’s that? Did I just hear your brain explode? Right? The mind is blown. I found these, I believe the cheapest was on Walmart. Ice cube trays with lids. For me, way better than the old standard egg carton with the lid, because their seal is a lot better. The paint keeps a lot longer. They’re just a little bit cuter than the ye old ice cube tray. Alright. The things they don’t teach us in college. Hoard those paper towel tubes, keep those old, dried up markers. Doggie dishes make the ultimate water tray. What were our professors even thinking? You’re welcome. Have a great week, guys. Y’all, it’s those little things. Paper towel tubes. You know I love them. Toilet paper tubes. I’m getting a t-shirt made. But man, it’s things like that, that’s what makes our class the best class in the school. Have a great one, guys.